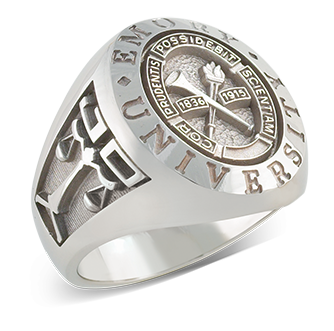 Herff Jones takes pride in creating college graduation rings for students and graduates of Emory University. Reward yourself with a symbol of excellence by selecting the Emory University ring which suits your style, experience and achievement. The Emory University College Ring comes in 4 sizes. Each size is defined by the oval-shaped ring top. Women most often prefer the small or medium size and men the large or extra-large size.